As above, so below, and the circle of life continues. Is it possible to purchase an electronic copy for logo for business cards? Very beautiful such amazing work! I have a real leather very large journal with the tree of life symbol on it which I haven,t used yet or written in. Really beautiful design work, I think the textures work very nicely indeed with it - your Celtic designs really look fascinating and beautiful! 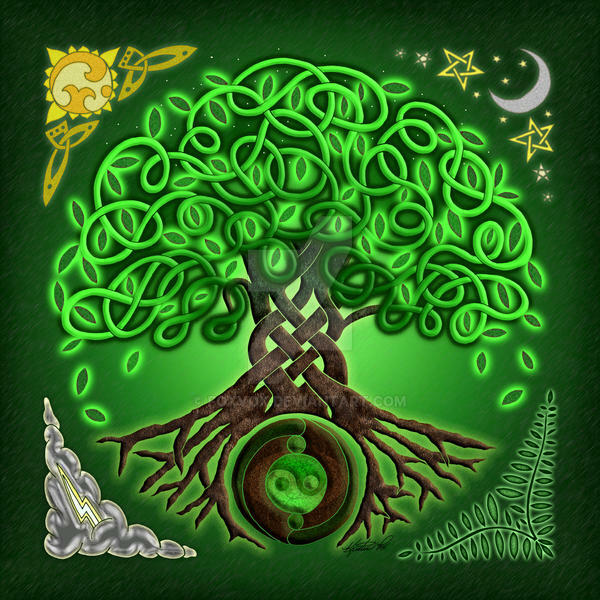 I recently made a roughly Celtic-inspired design as my ID (only inspired, not 100% in that style), and have always loved these kinds of artworks - yours really look stunning though and are of an entirely different level - love this! Beautiful! I love the vibrant colors in this swirling design. I got a tattoo of this on my shoulder, I really loved the colors, and how bright it was! I love this illustration and would like to buy the digital file for the cover of a presentation at a dream conference. I do not need the physical photo. I can either use a JPG or a PDF. Thanks in advance! Thanks SO much for telling me about this! I have sent him a message and posted comments on the images (2) that are mine. And thank whomever sent you that link too. I told the guy that he needs to ask permission and that a 10% licensing deal for image use/resale was common to the industry, etc. Yes, I have some copying problems too, not surprising. I handle what I can and try not to worry about what I don't know about - could spend three lifetimes writing C&D notices! So thanks again, and your works are really lovely! LOVE LOVE LOVE this! Do you ever sell your images to be used for the web like as a logo or something like that? I would love to do that if possible! Let me know! These are all wonderful and I would happily give you credit too! Really gorgeous and intricate. 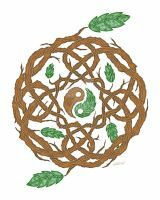 I love the yin/yang among the roots and the bolt in the clouds. When I left a comment giving you the credit you deserve, one of the moderators of the page got all huffy and said that the watermark was enough credit and they didn't have to give any more credit than that. D: I disagree, since it was actually pretty hard to make out your user name from the watermark. Since then, they have deleted my comments and have set it so that people can't make comments on it anymore. Furthermore, when I found out that I'd previously liked it (probably because I like it here on deviantArt) and tried to unlike it, I wasn't permitted. I've also been blocked from posting on that page, whereas my other friend Sara is still able to post on their page and make comments. That's not okay in the least. Wow - thanks so much for the heads up and for trying to get me credit too - I really appreciate it. Unfortunately, trying to track down this sort of stuff online is like a perpetual game of whack-a-mole. *sigh* My latest approach is to just say, 'hey, I see you found my design; the original is here...' or something. I was able to add a comment to that thread in that vein. I won't even go into the commentor who said she had it tattooed on her lower back - pretty sure she's not one of the people who have asked permission in the past. But anyway - thanks for looking out for my art. Love it! Well done clean flow...very very nice! Beautiful. 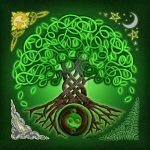 Of all Celtic legends, stories about the tree of life have always been the most inspiring to me. 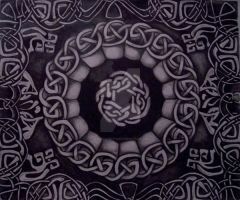 I've gone through quite a few Celtic Knot schemes and drawings, yet I've never encountered something that excites me as much as your work here. my I base somehting off this in my art prodect? Hoy! 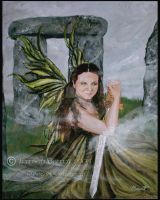 I am Irish and I feel like I should figure out if my ancestors had done Celtic stuff! I truely love this! Groovy, really like the cross- culture aspect. To deny the Tribal purity snobbery is reality. History proves as our ancestors moved,intermingling of man Cannot be disproved. With all the migration.racial stagnation was thankfully prevented. Wherever peoples temporarily put roots. Very nice. But it has a yinyang. Doesn't sound celtic. Love the glows. makes it stand out and beautiful but not painful. Oh my gawd this is AMAZING! I want it as a quilt on my wall or something. Amazing! Love the Sun and the Moon, all the motives are wonderful and precise. Great choice of the types of green color! It's epic! I love everything about your design except the spiral in the roots. I think it's the smooth circular feel there contrasting with the knot work elsewhere. Your colors are beautiful and the framing of the tree with the corner art makes for a wonderful full picture. 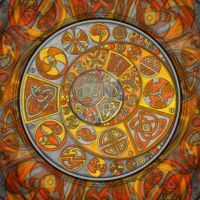 Amazing...may i use it as a logo of my druidic circule? 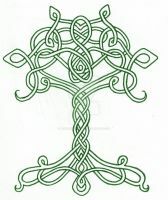 i am going to get this as a tattoo in memory of my grandpa who die on thrusday.